Hey guys, so today I am going to be talking to you about the new duct tape that I bought a few nights ago. I bought the gold duct tape. I have had this tape before but I am currently running low so, I thought that I would pick some more up. I purchased it at Walmart for $4.99 (not including Tax). I believe you can buy this tape at Micheal's as well but it will be a little more expensive. It might be more around $7.00. I spend time finding what place has the best deal. The Gold duct tape is part of the metallic collection. In that collection it also includes Chrome. I love the gold duct tape because it is a perfect accent colour to go with any other pattern of tape. 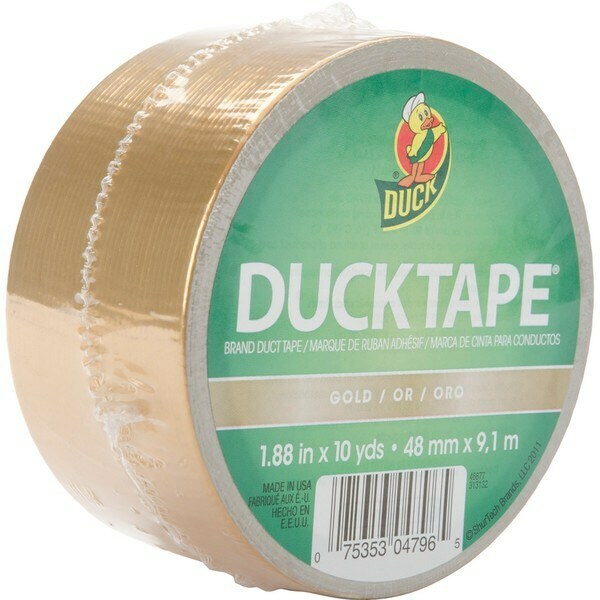 My favorite colour combo to go with the gold duct tape is the peacock tape. It makes the peacock look extreme! Anyway, that is all for this post and I just wanted to share my new tape with you guys. Remember to always stay Cute, Creative and Crafty. Hope you enjoyed!